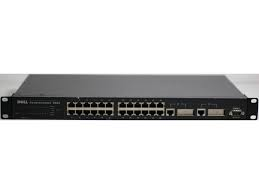 The Dell Powerconnect 3024 is a high-performance 24-port 10/100 non-blocking Layer 2 Ethernet switch. The Dell 3024 features a 12.8 Gbps backplane capable of 9.5 mpps and 8000 MAC addresses. The Dell 3024 comes standard with 2 1000Base-T ports and 2 GBIC slots.